NEW YORK (CNNMoney.com) -- Toyota Motor Corp. has announced a recall of 2010 model year Lexus GX 460 SUVs related to an increased risk of rollover. The recall covers about 9,400 SUVs in the United States. Worldwide, about 34,000 vehicles are covered -- including about 21,000 Land Cruiser Prados, a model not sold in the United States. 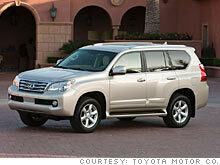 The automaker recently suspended sales of the luxury SUV after a report April 13 by the magazine Consumer Reports. The magazine said its test drivers uncovered a problem during routine tests. The SUV's electronic stability control program failed to keep the vehicle in line during a severe handling maneuver, allowing it to slide almost completely sideways, the magazine said. That situation could lead to a rollover, Consumer Reports spokesman Doug Love said. The magazine urged car shoppers not to buy the GX 460 until the problem is remedied. Toyota suspended North American sales the day the report came out, and the next day it expanded the suspension worldwide to also cover the Middle East and Russia, the only other markets in which the SUV was available. Toyota says Lexus dealers will update software which controls the Vehicle Stability Control, or VSC. VSC, also commonly called Electronic Stability Control (ESC), is a computerized system that controls the brakes and accelerator to help maintain vehicle control in abrupt maneuvers. Lexus dealers will have the VSC program updates by the end of April, at which time owners will be asked to bring their vehicles in for the software to be changed, Toyota said. The work is expected to take no more than one hour per vehicle. In the meantime, Toyota is offering free loaner vehicles to GX 460 owners who do not want to drive their vehicles because of the problem. Toyota said, in a statement, that it believes the GX 460 is safe to drive without the recall fix, provided drivers remember to reduce speed in turns and to press the brake pedal sharply when making high-speed turns. No other Toyota or Lexus models are involved in the recall, Toyota said in a filing with regulators, because differences in suspension design, weight balance and tires prevent them from being susceptible to this problem. The Lexus and Land Cruiser vehicles involved are all left-hand drive vehicles with 18-inch wheels and Toyota's Kinetic Dynamic Suspension System.